As Ken Blanchard, John Carlos, and Alan Randolph clearly demonstrated in their previous bestseller, Empowerment Takes More Than a Minute, empowerment is not a goal that can be achieved in a minute. Empowerment is a process that requires ongoing effort, awareness, and commitment to transforming the hierarchy. This essential guide offers managers detailed, hands-on answers to their real-life questions about how, exactly, they can navigate the journey to empowerment. 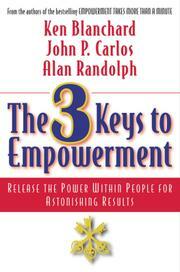 Written in an easily accessible Q&A format, the book closely examines and expands on the three keys to empowerment originally presented in Empowerment Takes More Than a Minute-sharing information, creating autonomy through boundaries, and replacing the hierarchy with teams. It clearly outlines the promises and challenges of each stage of the journey, providing managers with thought-provoking questions, clear advice, effective activities, and action tools that will help them create a culture of empowerment. Wherever they are in the journey, managers will find a clear roadmap in this user-friendly action guide.